If you want your ex to be attracted to you again, you have got to understand the mindset which will make this happen. We all know that begging and pleading is unattractive, and so is telling them how much you love them over and over again. There is a certain type of mindset that you need to achieve which will make your ex attracted to you again. To achieve this mindset, you have to understand one of the psychological factors that are embedded in every human brain. No, it’s not about how “We want what we can’t have”. It’s about mystery. People are attracted to things that they don’t understand. The more mysterious you look to someone, the more they will think about you and the more they think about you, the more they will fantasize about you, and the more they fantasize about you, the more they will hopelessly fall in love with you. Let’s take a step back and look at an average person who has just been dumped by their ex. Let’s call him Mike. Mike’s ex gave him some lame cliché reason for the breakup. Now Mike is trying to find out the real reason for the breakup and he keeps on thinking about what happened and why did his ex break up with him. The more he thinks about his ex, the more he finds himself hopelessly in love with her. His ex is like a mystery to him at the moment and he just can’t stop obsessing over her. Mike’s case is pretty normal after a breakup. The fact is that the more we think about something, the more we find ourselves attracted to it. Of course, you have to have a reason to think about someone. So how do you make your ex think about you all the time? Facebook has become an important part of everyone’s life. It’s a great way of keeping in touch with friends, and meeting old friends again. Facebook is also used to learn about someone and what they like and what they don’t like. What you do on facebook is now actually a part of your social life. How you interact with people and how you respond to status updates, comments etc. After a breakup, what you do on facebook is actually extremely important because you can bet that your ex and their friends are keeping an eye on your facebook profile. So let’s look at a few things that you can do on facebook that will destroy your chances of getting back together. 1. Sad status updates: It’s quite normal. Someone breaks up after a long relationship; they feel heartbroken; and they feel the need to share their pain with the world. And the next thing you know is a depressing sad status message which shows that you are not able to handle yourself after the breakup. Well guess what, your ex saw that, and so did all their friends. But that’s understandable since you were so much in love with them, right? No it’s not, like I said in the first step of the 3 step plan, begging and pleading and telling them how much you love them is just going to drive them away. And sad status updates are just a way of telling them how much you love them. So, do yourself a favor and stay away from sad status updates. 2. Commenting on your ex’s status and posting on their wall: You’ve got to give your ex their space after the breakup. Commenting all the time on their status and posting on their walls is almost the same as following them around all the time. It’s downright stalking. So, just staying away from your ex’s profile is a good idea. 3. Relationship status: What should you do of your relationship status? If you change it from “In a relationship” to “single” you will find that people commenting on the change. Comments like “I am so sorry dude”, or “Welcome to the single life” are like pouring salt on an open wound. Instead of changing your relationship status, you can just remove the relationship status option from your facebook profile. To do that, just go to your relationship status and select the empty box on top. It will remove the relationship status option from your profile. 4. Blocking Your Ex Completely: Well, if you are mad at your ex and you decide to completely block your ex, in an attempt to show that you don’t care anymore, you might actually be hurting your chances. Showing too much hostility only shows how much you were hurt from the breakup and how unstable you are. 5. Obsessing over your ex’s profile: This is the biggest mistake that you can do. After a breakup, it is normal to go check your ex’s profile and see what they have posted and what they are talking about with their friends. But if you find yourself doing it all the time and obsessing over every little status update that your ex makes, then you need to stop. There is no hidden meaning in their status updates, and no, they didn’t really mean it when they said “I feel awesome”. They are as devastated as you are from the breakup and they are just keeping their poise and trying to look sane on facebook. If you can’t stop obsessing over their profile, then it will be a good idea to unfriend your ex on facebook. I know that this is contrary to mistake no. 4, but you need to understand that you have to put yourself before your ex. That is the key to winning back your love. If you always put your ex before yourself, you will have a hard time getting them back. How To Be Sure If You Want Your Ex Back? Wanting to get an ex back is like a knee jerk reaction after a breakup, especially if you were the one who was dumped. However, you have to understand that in this emotional state of mind, you aren’t really in control of your emotions to actually make a good decision about your life. First of all, you need to think why you want them back. Just generic responses like “I love them’ or “I can’t live without them” or “We were really good together” will not do you much good. We often use these statements to avoid the specifics. You have to be more specific. What was so different about your ex that you can’t find in anyone else? Sometimes, it is better and much easier to just move on than trying to hold on to someone who isn’t really that great of a person. Most people fall under the illusion that they are in a deep meaningful relationship even if the relationship is just a couple of months old. If you went out with your ex for less than 3 months, then you really need to rethink about getting back together. Of course, if your relationship with your ex was toxic, then you should definitely stay away from them at all cost. On the other hand, if you think that you two had a great relationship and had been together for a long period of time, it will be different for you. If you two had been married and had children together, then maybe it will be different for you. It is in these situations that you should put in the effort to recuperate the relationship because it will be worth it. In essence, you should know it deep inside if your decision of wanting your ex back is really worth it or is it just a knee reaction to a bad breakup. Remember, there is no one who knows your story better than you, so it will be best to decide yourself. The last thing on your mind after a breakup may be dating someone else. Just the thought of making another relationship work makes you sick at your stomach. But, there doesn’t have to be a “relationship” if you merely date someone else that you’re somewhat attracted to. Getting back out into the world of dating is extremely important at this time of your life. It will give you a more panoramic view of what your life can be and let you know that you can be happy again. If you’ve been out of commission for quite a while, you may have lost contact with other single friends who could lead you back to the places where you can meet new people and have a life outside of home and work. You may have friends who know singles or you may decide to go to one of the online dating sites to meet someone. When you do meet another that you’re attracted to, ask yourself if you could grow, emotionally, spiritually and every other way with this person. Is he or she able to provide that? If not, don’t waste your time. There are too many fishes in the ocean for you to waste your time on one you’d have to throw back anyway. It’s normal to compare the new person in your life to your ex. In fact, you should make a comparison. You should be able to find out how your ex stacks up in no time at all if you’ve done your groundwork and know why yours and your ex’s relationship failed and what you’re really looking for in one that will last. When you compare and find something you don’t like about the other person, don’t think you can change the behavior or personality – it just doesn’t work without causing resentment. Eventually, you’ll meet someone that you believe you could care about and make a life with. Don’t rush in to a live-in relationship or marriage. As time goes by, you’ll find out more details and will be able to picture your life together. 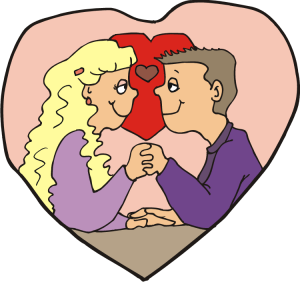 Dating sites on the Internet let people get to know each other before a physical relationship begins – if both are honest in their communication. It’s a good way to meet lots of people in your area and pick and choose which ones you think there might be a connection with. You can be a little more confident and daring when you’re talking to someone over the Internet and may find out more about the other person than you could if you were physically together. Other ways to meet new people are in your church or synagogue, friends who know you and may know another who would fit in your life, work (be sure to check out the rules your company has for dating in the workplace), play (do you like to participate in a sport or perhaps a community theater? ), or simply getting involved in things you like to do. Many successful relationships have begun by meeting while walking dogs! Keep a positive attitude about dating – and keep in mind your absolute requirements for another person to enter your life. Don’t settle for less – you don’t have to.